When I took my trip up north for The Glasgow School of Yarn, I made myself a resolution: Not to buy any full skeins of yarn. My stash is large enough, and I've got a move coming up so both space and cash are important to keep. Luckily, several of the vendors at the marketplace were offering up mini skeins, perfect for my Beekeeper's Quilt. 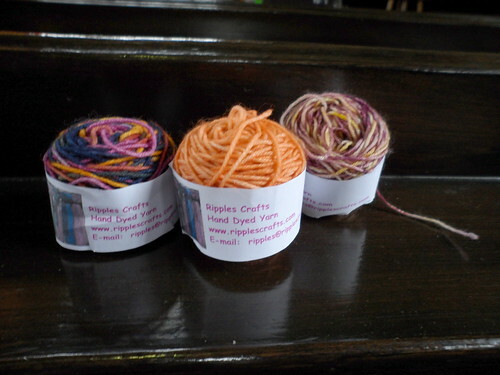 The minis allowed me to sample a variety of new yarns and dyers, giving me just a taste of their yarns. First up was Skein Queen. I'm already a big fan of SQ yarns, so I knew I would want some of these. She was selling minis in a set of 5 skeins, in a variety of colorways, for £8. Right next to the Skein Queen booth was Ripples Crafts. I picked up three mini cakes of theirs at £1.60 each. Lastly, I strolled by The Yarn Yard booth, who was selling minis of laceweight silk (great for embroidery, but also fine for hexis! I'll be knitting it doubled or maybe even triple). These were £2.50 each. I love both colors, for totally different reasons - the striking bright purple and the subdued, lemongrassy yellow/green variegate. 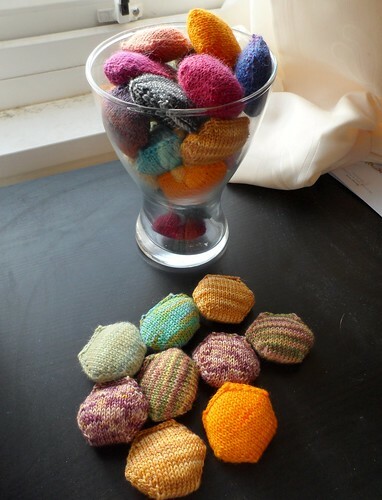 Over the course of my trip, I managed to knock out 9 hexis - some with the new yarn, some with old.